*Note: Dates are a good source of various vitamins and minerals. Its a good source of energy, sugar and fiber. Essential minerals such as calcium, iron, phosphorus, sodium, potassium, magnesium and zinc are found in dates. It also contains vitamins such as thiamin, riboflavin, niacin, folate, vitamin A and vitamin K.
How to: – Pitt the dates ( for more thickness you can soak them in water for a few hours) – Add the water/dates/cocoa powder and agave into the Blender. – Blend until ingredients are fully mixed – add the oat Flower and the Ice-cubes and Blend ( You may need to Pulse at first to get it going_ – Viola! 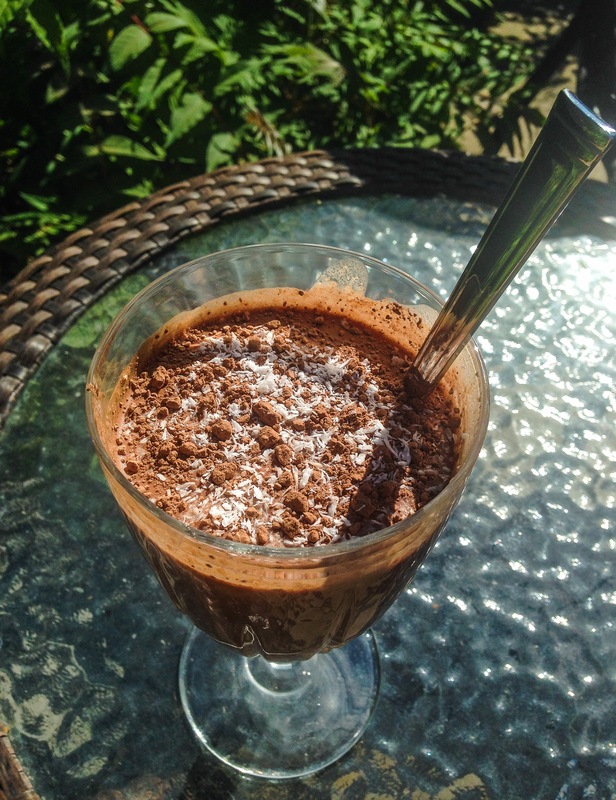 you have your Frozen Hot chocolate 🙂 – Sprinkle with cocoa and Coconut shavings if you like!!! or you can add some coconut cream on top for taste! The oats give the drink more thickness, if you feel you do not want them in there then make sure you soak your dates for a longer period of time 🙂 FUN FACT.. if you add more oat flower, you have just made yourself a pancake mix 😀 Hope you enjoy!!! as always YOU’RE WELCOME! follow me for more Recipes & overall vegan goodness 🙂 Love! Previous *Bliss Soap* is Guilt free, Luxurious & Amazing! Next How to find the BEST Vegan & Cruelty-free Products! It looks so good and that gif is perfect! This sounds so good! I’ll definitely have to try this! !